Thank you all so much for sticking with us through the last year. This is our last episode until autumn, when we will come back after our summer hiatus all recharged and ready to rumble. In the meantime, we still have nearly an hour of Country Dweller Discussions. 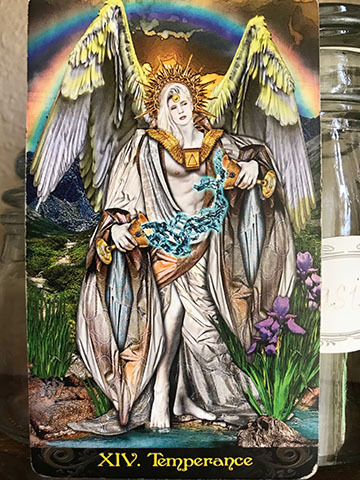 We get a visit from the Temperance card; we talk Hedge Witch tips; The moon is waning gibbous in Aquarius and what does that mean for you and your magic. We connect with festivals and preview that we’ll be at Puget Sound Pagan Pride on October 28. We make Pizza Tacos during Cauldron Cooking and Pay It Forward. As always we leave you with some Old Ones Wisdom and a Spell of the Week. Don’t forget to connect with us on Instagram, Facebook, and Twitter! 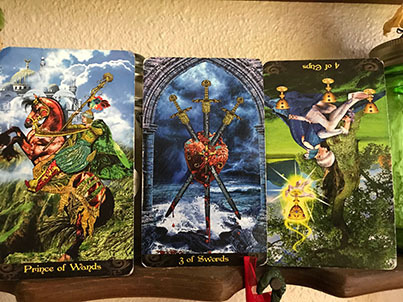 We have a fiery three-way tarot reading this week, then talk about veggie planting. Then there’s this Scorpio Moon of endings. We learn about the stone Beryl. We challenge you to try something new this summer, maybe even try your hand at this week’s Cauldron Cooking: Rhubarb-Strawberry Pie with a bit of pucker power magick. Kissey-kissey! We do a little preaching on journaling and talk about food as medicine. As always we leave you with a powerful spell of the week. Apologies if the puppies playing int he background of the podcast are distracting. Runa’s familiars were a bit hyper this week — they’re getting pumped up for summer. 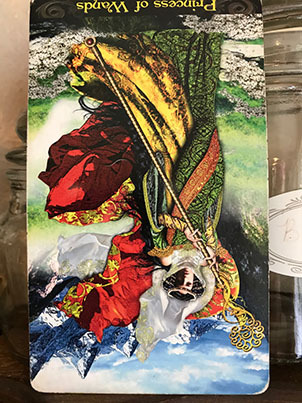 The Princess of Wands drops in on us. Welcome back, listeners! MareLin & Runa are so excited for the warmer business of Beltane. But first we have a visit from the Princess of Wands. Then we discuss the Witch’s Creed. Moon cycle is second quarter waxing Gibbous, or the Moon of Endings, landing in the sign of Libra. As always MareLin tells you what to expect, how to cope, magic to do and crystals to play with during that time. We also play guess that stone as Runa cleans out her witchy studio. Then its Beltane celebrating, cooking, flower-getting, and spell making. Technical Note: There’s some small audio gremlins in this episode, so please forgive these small glitches. Hasenpfeffer stew over sauteed cabbage and carrots. So much easier to use a resealable bag for both marinating the meat and dredging it in flour. Back in the day, people used to raise their own meat. In urban areas this very well could be meat rabbit or squab. Today, we’re talking about rabbit. It was sometimes called city chicken. For the tale on that, check out the podcast this recipe was featured on. The magic in this recipe has to do with the comfort of home, as well as the energy of youth, and the good memories that continue to feed us. Yes, this is a recipe that includes meat rabbit, which is sometimes unheard of depending on where you live. But it’s packed full of good nutrition as well as nutrients to fuel you through transitional seasons. It’s also has the energy of making do with what you have into something special. Go out of your comfort zone and give this one a whirl. Your dinner guests and cauldron will thank you. In the photos, Runa included sweet potatoes and some red onion. Both are optional. However, this recipe does include instructions for it. You can see why people call this city chicken. You can use any flour you like. The photos here show whole wheat flour. Rabbit bones can be very fragile. Be sure not to cook too long before you decide to de-bone it. 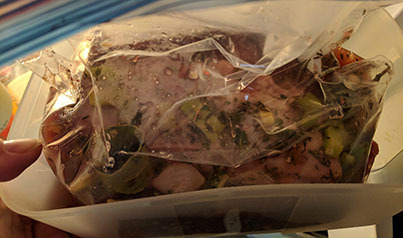 Runa always uses a resealable plastic bag when marinading or dredging the meat. However a glass dish or ceramic pan will work, too. This recipe traditionally is marinaded for 48 hours; but, you can push the marinade to 12 hours and it doesn’t affect the flavor. Runa has put the rabbit in the marinade first thing in the morning and made the stew that night. Still yummy. This is a stew, not a soup. You do not have to serve over anything, but we love having sauteed cabbage & carrots with this. You can “cheat” and just buy a “cole slaw” bag from the produce department of your local market. 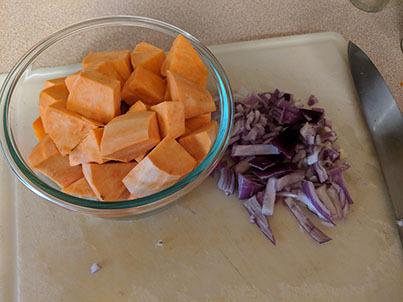 One sweet potato cubed and a small red onion chopped in big chunks add a great flavor to this dish; however, both are optional. Need to slow the cooking down a bit? Use a lid. Otherwise, tops off! Bring first 14 ingredients to a boil in a medium pot; turn off heat and let marinade cool. 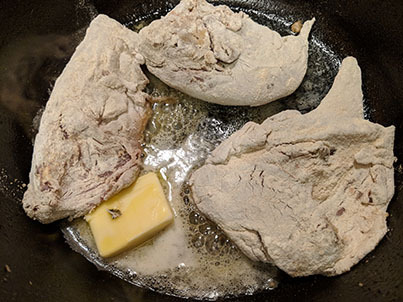 Place rabbit pieces in a resealable bag (or a glass jar or baking dish); pour marinade over. Cover and chill for 12 to 48 hours. 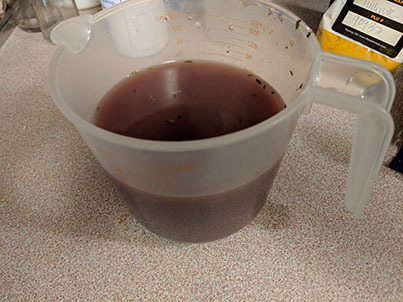 Remove rabbit from marinade; strain marinade through a fine-mesh sieve and set aside; discard solids in sieve. Heat oil and butter in a large heavy pot. Place some flour in a shallow bowl or resealable plastic bag and dredge rabbit in flour, shaking off excess. 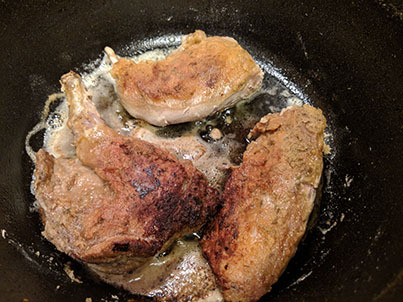 Working in batches if needed, cook rabbit, turning once, until golden brown, about 4 minutes per side. 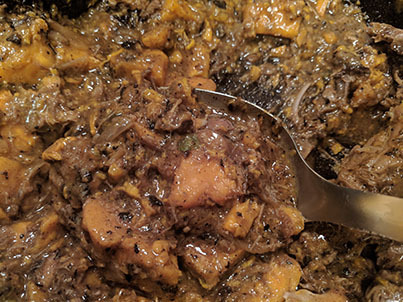 Transfer rabbit to a plate and cook sweet potatoes and onions in drippings from pot, about 5 minutes to soak up seasonings and let onions get translucent. Pour reserved marinade into pot and bring to a simmer. Add rabbit pieces, cover, and simmer gently until rabbit is tender, about 60 to 90 minutes. Take rabbit out again, let cool to touch and de-bone. Put meat back in cauldron and simmer for another 30 minutes, stirring as necessary to keep from burning. 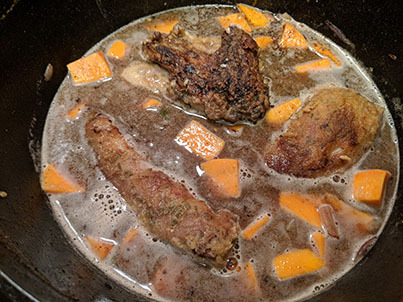 In the last 15 minutes of cooking the Hasenpfeffer begin to saute your cabbage and carrots. 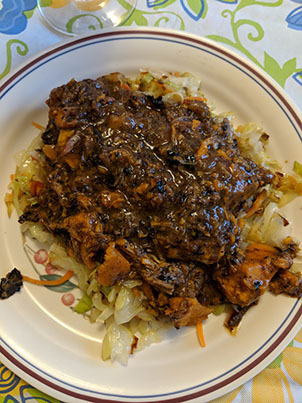 When marinade is reduced and rabbit tender, serve the Hasenpfeffer over sauteed cabbage and carrots (or traditionally boiled potatoes or cooked egg noodles). All cooked down and ready to eat. So good and so good for you. Hasenpfeffer.